Although the CR1000 datalogger may replace our CR10X for many applications, existing CR10X customers who do not need the new CR1000 capabilities and prefer to program their datalogger using Edlog instead of CRBasic can still purchase a CR10X. 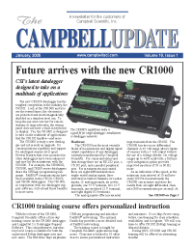 Campbell Scientific will continue to offer the CR10X as long as we can obtain the parts to build them. As with all of our dataloggers, we will also continue to service the CR10X as long as parts are available.